trombon1984 wrote: Instrument has some mechanical demages, because of its big. That has got to be some of the wackiest tube routing I've seen. Although I very much appreciate the tuning slide being accessible by the left hand. I like those valves. They actually unscrew from the top and lift out for cleaning and oiling. "The Helicon is very old (from year 1930 - 1935)." The badge says "Hradec Kralove CSR": Czech Socialist Republic, meaning that this was built sometime between 1969 and 1990.
bigtubby wrote: "The Helicon is very old (from year 1930 - 1935)." Or 1920–1938, 1945-1960: Czechoslovak Republic (ČSR). I don't know my antique Czech stuff, but at a wild guess, those valves look older than '70s to me. Not to be disagreeable but I will be interested in any information on this - I have an identical (excepting the fact that it is in F, not BBb) helicon. Every Cerveny I have ever seen that was built ~ post WWI and 1970s or so was marked "Czechoslovakia" or "Czecho-Slovakia". I'm quite interested in learning if "CSR" (Czech Socialist Republic) was used pre-WWII or in the early years of WWII. While I understand that the bell and/or badge on my "F" helicon could have been replaced, it seems unlikely to me that both mine and the virtually identical ebay BBb would have been subjected to the same modifications. Inquiring minds want to know, are my dating methods off kilter? Unwisely I responded to Mark's post before I read yours and had never been aware of "CSR" being used to signify "Czecho-Slovakian Republic". I have owned quite a few Cerveny tubas and still have three in my possession which carry those cast nickel silver badges and all of which share: brace design ("hourglass" for lack of a better term); stop arm design with bumpers integral to the stop arms); paddle/clockspring mechanisms and top loaded rotary valves. 1. 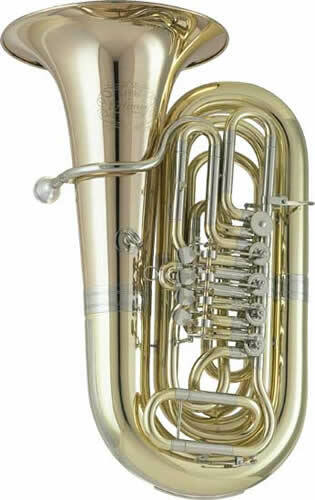 BBb tornistertuba. Presumably pre-WWI, badge says "V.F. Cerveny & Sohne Zukoniggratz In Bohmen" (well, it's all caps and I am too lazy to re-type it). I _think this was built around the turn of the Century; certainly before the end of WWI. 2. BBb Kaisertuba with removable recording bell (?!?). Badge on bell says: "V.F. CERVENY & SONS HRADECKRALOVE MADE IN CZECHOSLOVAKIA". To me this screams "Made for the U.S. Market" but when? I'd think 1920s - 1950s (???) because of the recording bell. 3. F Helicon that is very similar to the OP's BBb (as well as the two above). This came to me from Germany and so not surprisingly the badge isn't in English: "V.F. CERVENY & SYNOVE HRADEC KRALOVE C S R." (period only after the "R" in "CSR"). Information invited. Klaus, do you have any insights? <EDIT> I don't know if Ari is still at Amati USA but will send him an email tomorrow. Does the shape of the paddles say anything? My helicons were Amati & Lignatone, but I'm guessing that they followed Cerveny on parts like that, and they were like your BBb - a little longer than on the auction horn and your F, which seem perfectly round. And of course I have no reliable information on their dates, but pretty sure they were later, certainly post-war. Donn wrote: Does the shape of the paddles say anything? My helicons were Amati & Lignatone, but I'm guessing that they followed Cerveny on parts like that, and they were like your BBb - a little longer than on the auction horn and your F, which seem perfectly round. And of course I have no reliable information on their dates, but pretty sure they were later, certainly post-war. So much hearsay in terms of paddle shape. Newer (1960s+ maybe) clockspring Cervenys had "oval" or "square-ish" paddles. Those were also contoured where these round ones were flat (well, convex really but from a flat base). I've heard more than once that one has a better chance of getting a good horn with these "square-ish" paddles than with the newer tear drop shaped, coil spring tubas. But ??? I wish I had enough horns to test these suggestions. All of the tubas I enumerated above have the perfectly round, slightly convex paddles. I have an Amati CC tuba (I think ACB-481) with the "square-ish" contoured paddles and coil springs. A friend has the "same" with clockspring actuators. I honestly think that his sounds better but how many question marks can one post contain? And: Amati rotary valve instruments I'm 99.9% certain are always Cerveny built. I think that the same is true of Lignatone but not to that level of certainty. Here are a 1970s (I think) Amati ABB 481 and a 2000s (I think) Cerveny CBB 681 that I owned concurrently. I sold the Cerveny because I felt that the Amati played and sounded better. The Amati is raw brass and the Cerveny is "lacquer". Does that make a difference? <EDIT> I have no solid knowledge of this but I feel fairly certain that between the Amati and Cerveny pictured there was a re-tooling. I think that between those two instruments, Cerveny moved from all sheet metal to hydraulically formed parts (the large bows in particular). The other obvious difference is that the older Amati has the old "stovepipe" bell and the newer Cerveny has the more modern wider flare. The linkage on the Amati there is not original, right? The paddles on my newer helicons were indeed a bit squarish, though it's hard to see in a photo, and contoured. I had no complaints with the instruments, other than maybe the noise from the valves. Donn wrote: The linkage on the Amati there is not original, right? The paddles on my newer helicons were indeed a bit squarish, though it's hard to see in a photo, and contoured. I had no complaints with the instruments, other than maybe the noise from the valves. I'm pretty sure that the Amati miniball linkages are original. I bought this from a young fellow who told me that he'd purchased it as a NOS instrument. I have seen other Cerveny built instruments with clockspring/miniball actuators (my hunch is that maybe the Eastern European players like clocksprings?). <EDIT II> The recording bell Kaiser has adjustable spring tension as does the Arion above. Not to mention the thumb ring that can double as a dock fixture for a freighter.